Children's residential spaces generally include bedrooms and outside areas. Alternate areas may include separate play rooms or play areas located in family rooms or living room areas. The optimally designed space in a residence would include balance for children's active and quiet play. Finishes should be incorporated with hard and soft surfaces for comfort and noise control. Spaces with great rooms are large in scale, therefore, to accommodate a child's scale a separate area can be designed for a child's space. The ideal space incorporates sustainable, non-toxic materials and products for children's health benefits. 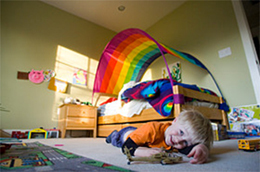 A bedroom design should include area for sleeping, quiet play, and active play, if space permits. Non-toxic plants offer children mental and physical health benefits. Children also take responsibility for taking care of plants and small animals which enhances their empathic understanding and skills. Shelving for books in the room encourages book looking and reading during independent time. Play areas with shelving for books and bins for materials and toys help children have mastery over their choice of play activities. The ceiling in a corner of a play space can be designed with fabric or paper cutouts of planets or dinosaurs. Visually lowering a ceiling with materials creates a small-scale space for young children's play. Adding color to a wall with paint or fabric creates a focal point for children as well as a background for materials and toys. 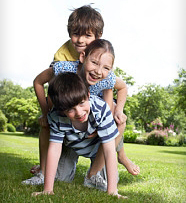 Allowing area for children's movement is the most important element of outdoor space. Vegetation in the outdoor space gives children the opportunity for learning about plants. Outdoor activities can be organized with balls and games or inventive with exploration and discovery of the natural environment.